Sometimes when you are dieting, you have a major craving for some carboydrates. Well, at least I know that I sure do! And when this craving hits, you need to make sure that you don’t eat the wrong food. 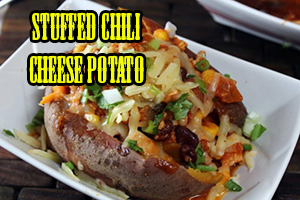 So often, when this craving hits me, I reach for my Stuffed Chili and Cheese Potato recipe. It’s under 500 calories, makes a great dinner and has carbohydrates!! In order to make it, you can microwave a potato for about 7 minutes. Then wrap it in foil and let sit for 5 minutes. While that is sitting, take a pot and warm up some chili and broccoli. Then cut the potato lengthwise, top it with the chili mixture, and sprinkle it all with cheese.